I love that a really good movie has the power to make me feel something. For example, I cry every single time I watch Rudy. Overboard and Sweet Home Alabama, on the other hand, are on repeat in my house because both movies put me in a really good mood. But do you know who loves movies even more than I do? My kids. My daughter wants to have magical powers like Elsa and sing like Rapunzel. My sons want to run as fast as Dash, and go to infinity and beyond like Buzz. They all want to roar like Simba, and have grand adventures like Baymax and his team of heroes. We’re such movie fanatics that we’re already planning our Oscars party. 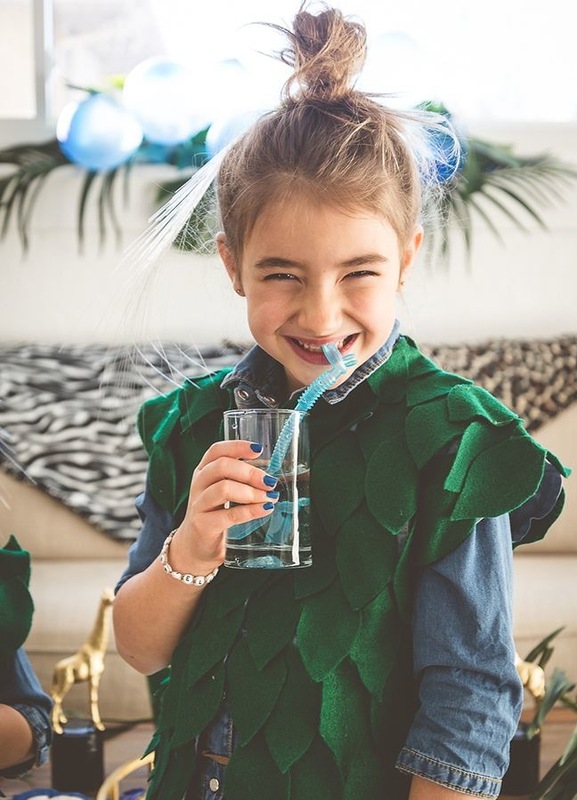 The inspiration for our kid-friendly bash came from Jungle Book and The Lion King, two of our favorite Disney movies. Ready to party? 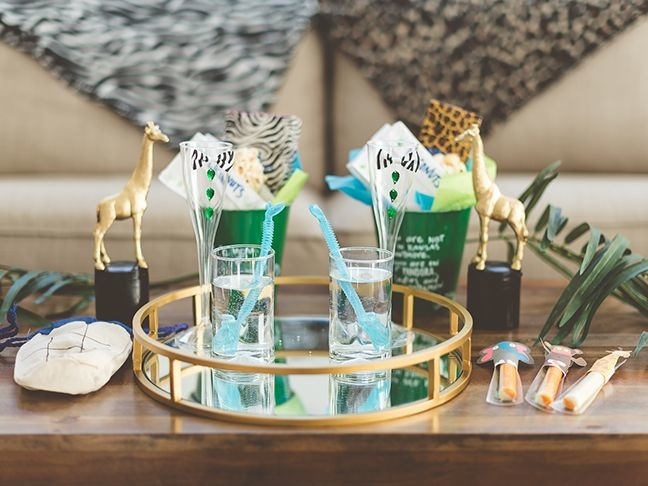 Here’s how to pull off our jungle-theme bash for the Oscars. 1. Create a festive entrance for your guests. Yes, the Oscars honor actors and actresses and movies, but it’s also all about the fashion. In lieu of designer runway dresses, we opted for clothing that’s much more comfortable and fitting for a jungle. 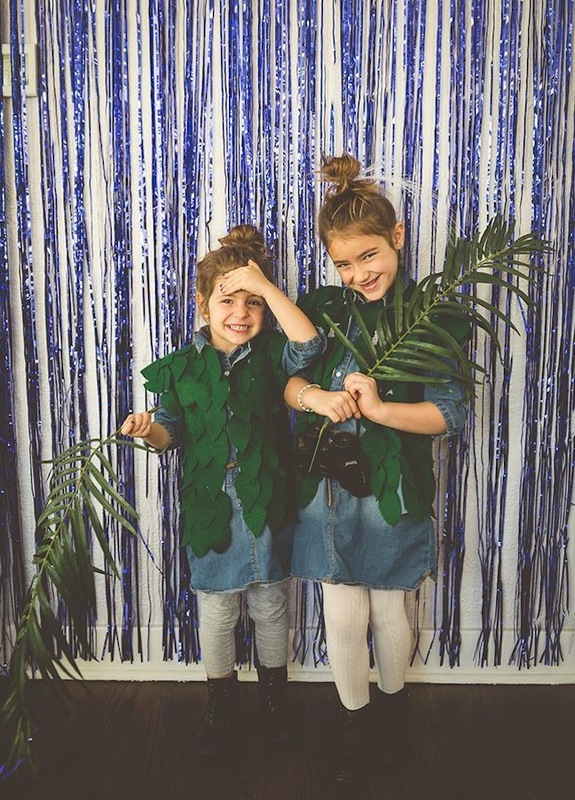 Make DIY leaf vests for guests to wear, and lay out extra safari essentials such as leaves and binoculars. I couldn’t sew if my life depended on it, so I bought a vest and covered it with leaves cut out of felt. I used fabric tape to attach the leaves and it worked great. For a shimmery pop of color, hang a fringe foil curtain on the wall. Don’t forget a camera or a phone for this part of the evening! 2. Create a cozy viewing area for the kids. It’s a long show, so kids need plenty of snacks and comfortable blankets to make it through the Oscars. Safari print fleece blankets will keep them nice and toasty. 3. Serve fun snacks. Popcorn and candy are a must at every movie. 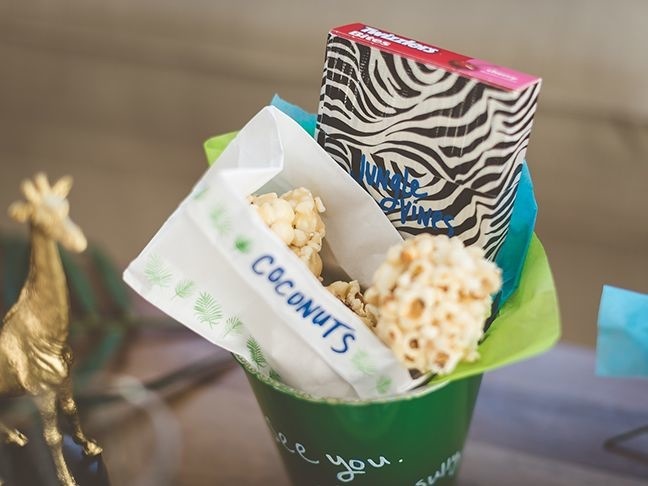 Wrap the candy boxes with safari print duct tape, and name the candy after things you’d find in an animal kingdom (Milk Duds make the perfect elephant droppings and Twizzlers are ideal as delicious jungle vines, for example). Roll homemade caramel popcorn into balls for coconuts. Serve them in white lunch bags with decorative stamps. 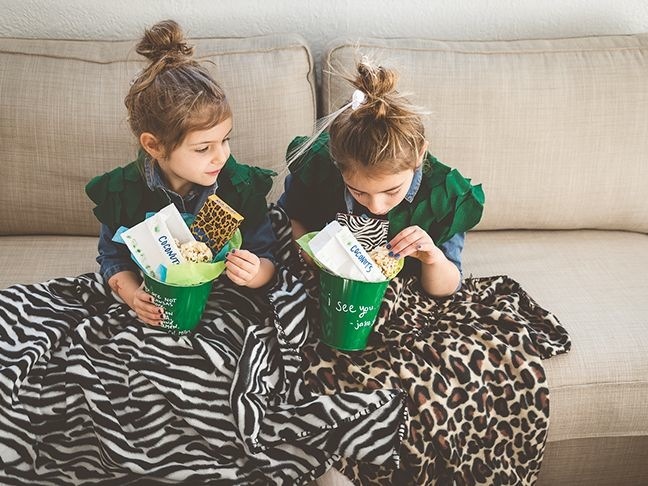 Create popcorn containers by painting galvanized buckets green, and adding your favorite movie quotes on each one with a paint pen. Another really easy food to serve is cheese sticks. 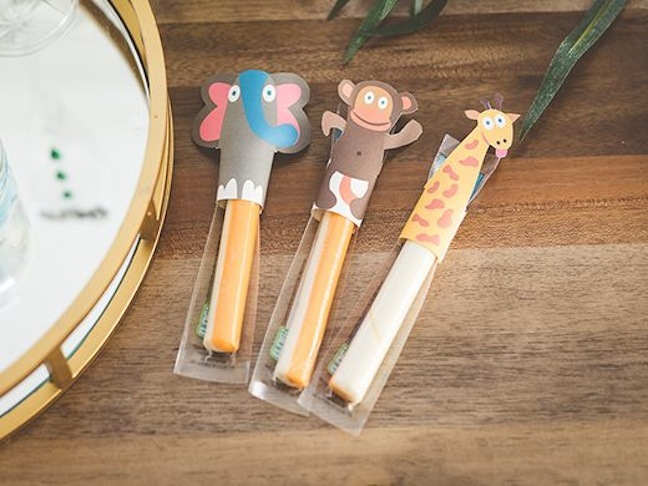 Kid love finger puppets, but before they play with them, print the paper puppets and wrap them around string cheese. 4. Don’t forget the cold drinks! To wash all the sugar down, serve water. 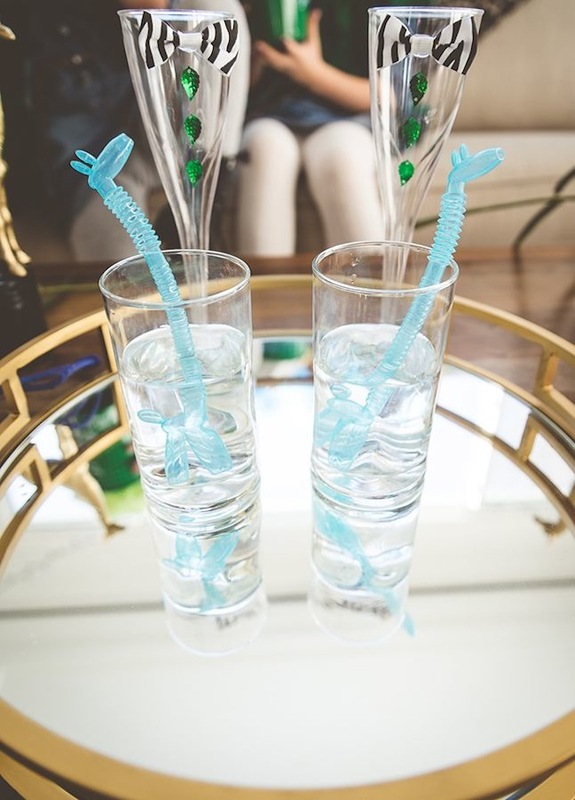 It’s a lot more fun when guests can drink it with giraffe straws. Once champagne is ready to be served, make the glasses look festive with a zebra print bow tie and leaf shirt buttons. 5. Don’t forget Oscar. No Oscars party is complete without the golden statue. 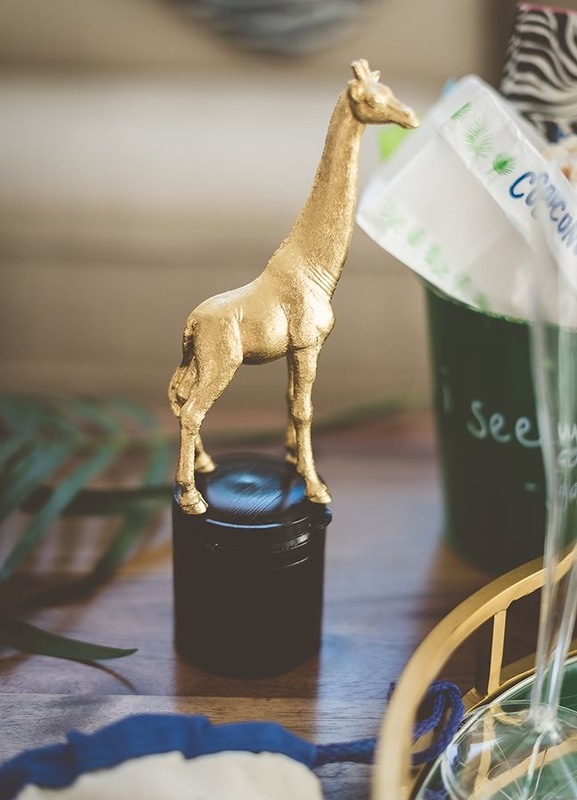 Instead of a man, coat a toy giraffe with gold spray paint. After painting, I glued the giraffe to an M&Ms to-go bottle that I painted black. An award that doubles as a treat container? Score! 6. 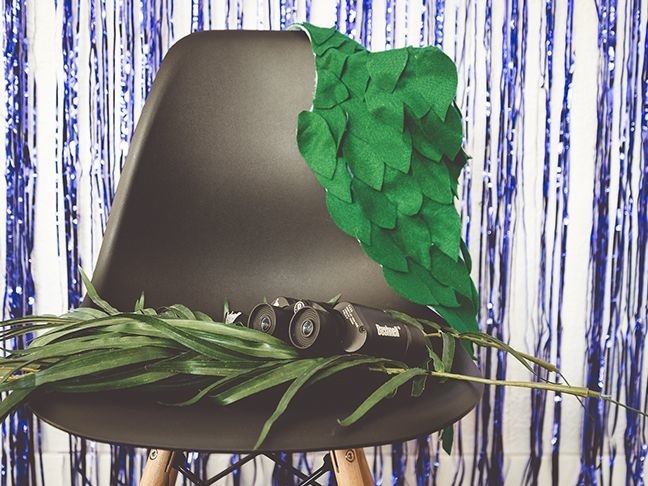 Create a simple and modern jungle scene. 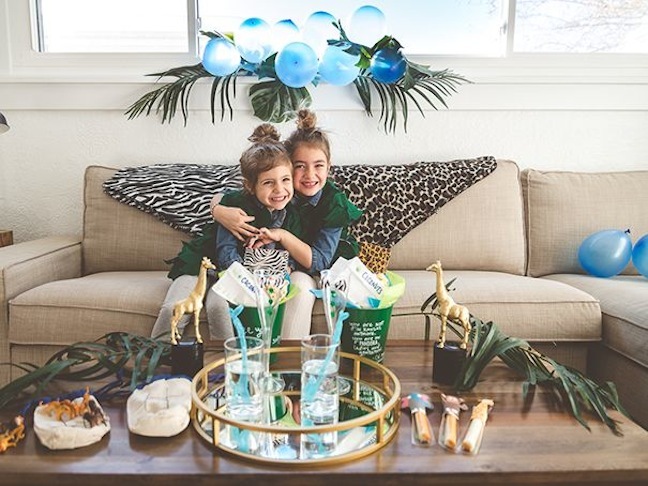 For a festive jungle feel, make an easy wall arrangement with tropical leaves and bright blue balloons that you string along a balloon deco strip, and hang on the wall with painter’s tape. 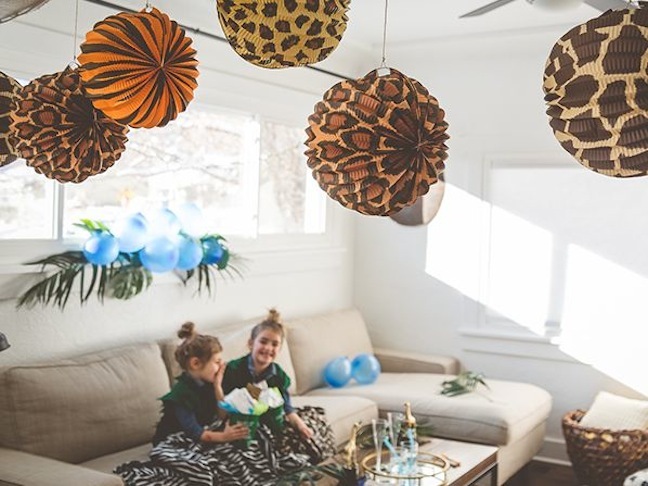 Every party is cuter with lanterns, so hang safari print lanterns from the ceiling. 7. 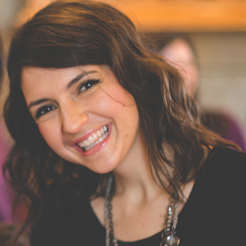 Give kids party favors to remember. When I was young I loved fiber optic light wands, so I’m bringing them back. 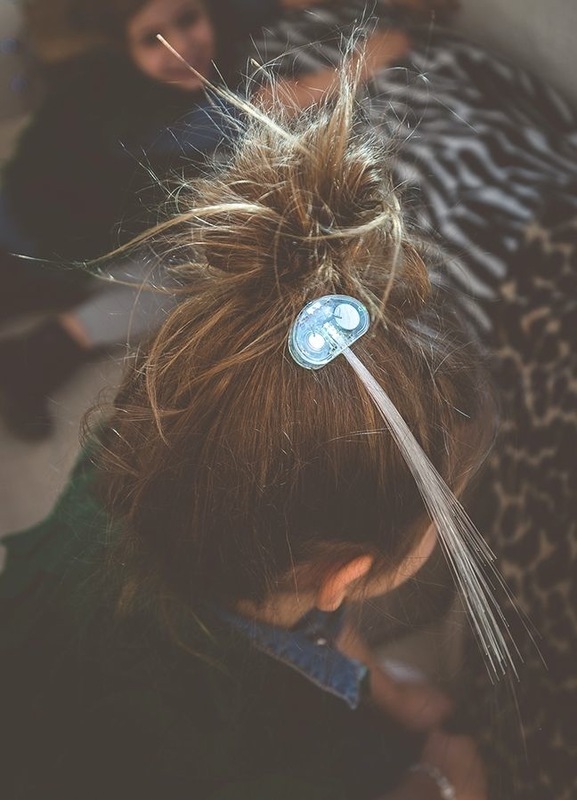 Give the kids fiber optic hair pieces that will flash a bright color. Tic-tac-toe is a classic game that kids adore, so add a jungle twist for a new take on it. 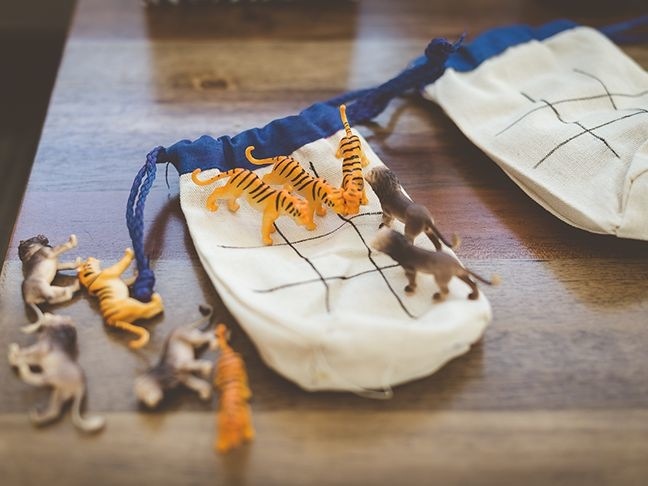 Instead of x’s and o’s, draw the playing board on a small favor bag and play with tiny jungle animals you might see at Disney’s Animal Kingdom (think lions, tigers, cheetahs and giraffes). It’s a grab-and-go game for all ages!